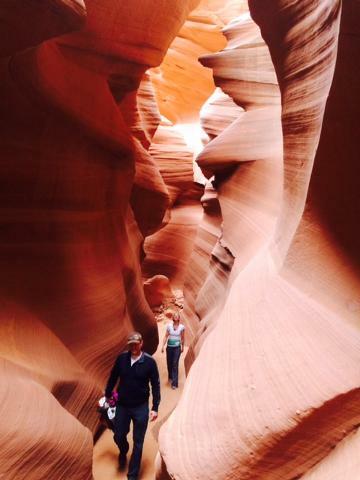 Daily departures from Flagstaff to the world famous Antelope Canyon and Horseshoe Bend. The scenic drive from Flagstaff offers unforgettable views of the Painted Desert and Navajo Nation with 80 mile views across the Colorado Plateau. Watch the scenery change you move from towering Ponserosa pines to the vast red, pink and white sandstone expanses of Page. 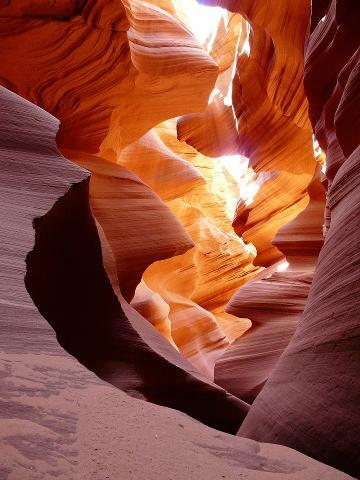 These colorful Canyons offers amazing photo opportunities between sculpted sandstone walls with a walkable corridor at the bottom of the canyon floor. It was formed by flash flood waters that rushed into the cracks of the Navajo sandstone along with the power of wind erosion. With the penetration of daylight through the narrow opening from the top different kinds of light reflections and colors can be seen and enjoyed. This amazing color makes this area a popular location for photographers and tourists. From the canyon, we visit an area where the Colorado River made a 280 degree turn around the Horseshoe Bend shape of rock. 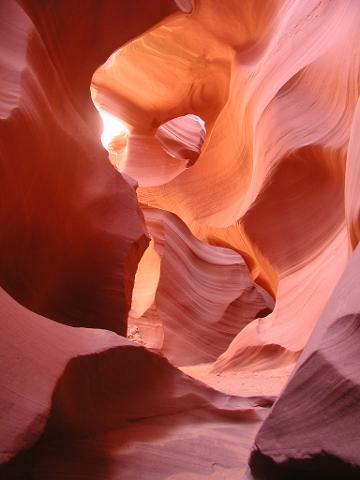 Upper Antelope Canyon begins with a 4 mile, 4 wheel drive drive up a sandy river bed to reach the entrance to the canyon. Once at the canyon, guests will walk on a flat floor, between towering sandstone walls that sometimes narrow to only a few feet. 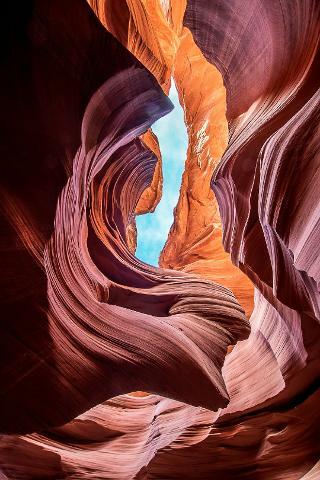 This photographer's dream is one of the most photographed slot canyons in the world. The entire Upper Antelope Canyon tour takes approximately 90 minutes, including the 4 wheel drive approach and return to town. 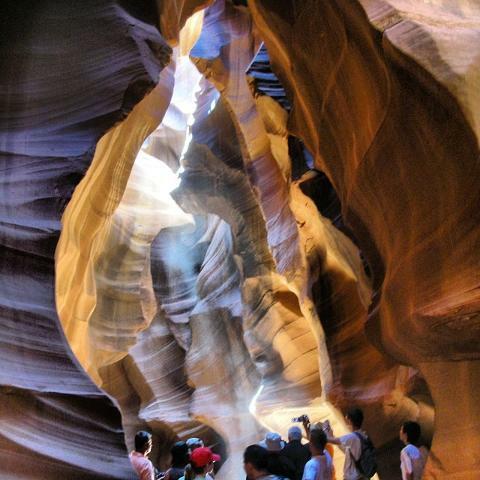 The Lower Antelope Canyon walking tour is approximately 10 minutes from the center of Page, Arizona. Guests will walk approximately 1/4 mile to the lower end of the canyon, where they will enter the canyon by a staircase with railings. Once in the canyon, guests will walk through a narrow sandstone canyon with a few ascents of staircases, moving toward the upper end of the canyon. 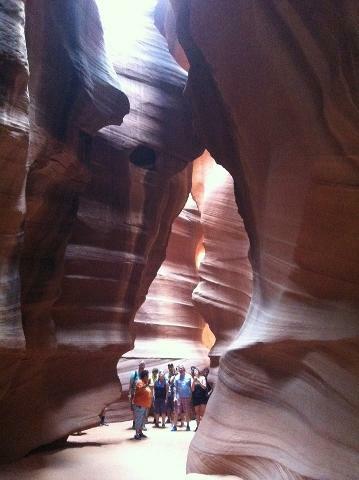 There are numerous amazing photo opportunities and the Navajo guides will share some history and culture of the area. The tour is approximately 75 minutes in duration. 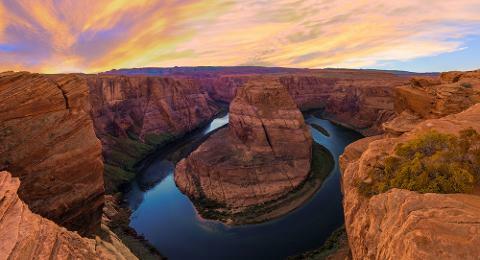 Horseshoe Bend Overlook requires a 1.5 mile roundtrip (2.4 km) walk over sand and rocks. Guests will reach a 1000 foot canyon as they look down upon the Colorado River in the bottom of Glen Canyon. 1.Suggest to bring extra water. 2.Sun Protection Recommended: Sunscreen, chap stick, sunglasses, hat, scarf, etc. 3.Suggest to wear comfortable outdoor clothing and walking shoes. 4.Bring Motion Sickness Medication, if necessary. 5.Your cell phone may not have signal in some areas. 6.If you plan to have a night tour or show for the same day after the tour, please leave enough time for each activity. The tour duration may be changed or extended depending on weather, traffic conditions or Acts of God. CHD Inc. will not be responsible for missing a show, tour or flight. 7.Children and babies must carry on the backs.